At Antiquity Oaks, we have a herd of about two dozen Nigerian Dwarf dairy goats that provide our dairy products. We make our own cheddar, mozzarella, chevre, parmesan, queso blanco, cheddar, buttermilk, yogurt, and more. These products are not available for sale, because we are not a licensed dairy. However, our family enjoys a bounty of fresh, delicious dairy products that are hormone and drug free. We also use their milk to make all of our own soap. Two of Deborah’s books, Homegrown and Handmade and Raising Goats Naturally, include instructions for making several types of cheese and goat milk soap, and she also teaches classes and speaks nationally on making cheese and soap and raising goats. 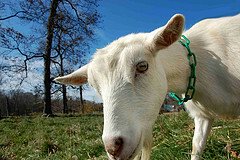 If you would like to know more about the goats, please visit them at http://www.nigeriandwarfdairygoats.com!